Glide SP mode enrichment results for two preparations of the DUD dataset and native ligand docking RMSDs for two preparations of the Astex dataset are presented. 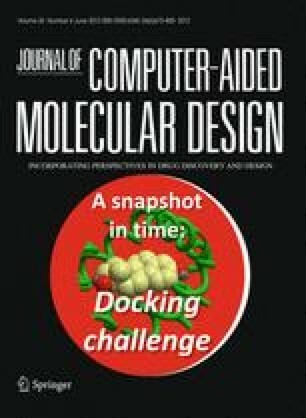 Following a best-practices preparation scheme, an average RMSD of 1.140 Å for native ligand docking with Glide SP is computed. Following the same best-practices preparation scheme for the DUD dataset an average area under the ROC curve (AUC) of 0.80 and average early enrichment via the ROC (0.1 %) metric of 0.12 were observed. 74 and 56 % of the 39 best-practices prepared targets showed AUC over 0.7 and 0.8, respectively. Average AUC was greater than 0.7 for all best-practices protein families demonstrating consistent enrichment performance across a broad range of proteins and ligand chemotypes. In both Astex and DUD datasets, docking performance is significantly improved employing a best-practices preparation scheme over using minimally-prepared structures from the PDB. Enrichment results for WScore, a new scoring function and sampling methodology integrating WaterMap and Glide, are presented for four DUD targets, hivrt, hsp90, cdk2, and fxa. WScore performance in early enrichment is consistently strong and all systems examined show AUC > 0.9 and superior early enrichment to DUD best-practices Glide SP results. The authors would like to thank Nick A. Boyles, Amy R. Rask, K. Shawn Watts, and Carolyn M. McQuaw of Schrödinger, LLC for their collection and curation of ligand binding affinities from the DUD and Astex ligand sets.